Guided walk, as part of the 2nd annual Irish Pilgrim Journey. Information, 087 7942123 or email: skelligkerry@gmail.com. Cosán na Naomh Dingle, Co Kerry (Sept 23,): Facebook: Cosán na Naomh/the Saints’Path. Want to enjoy an unforgettable experience at Easter, while celebrating Pilgrim Paths week? Then you can savour some unforgettable walking on the Cnoc na dTobar pilgrim mountain, Co Kerry. 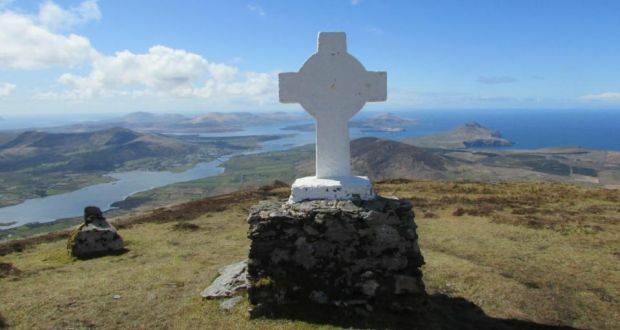 On Good Friday, April 14, local guide, Johnny Keating, who was the first Kerryman to complete the Irish Pilgrim Paths, is leading a walk up Cnoc na dTobar to celebrate Pilgrim Paths Week. The return walk is among the 5 required for those wishing to complete the new, Irish Pilgrim Journey Passport, so this is an opportunity not to be missed. Meet: The Old Barracks, Cahersiveen at 10,30am. Requirements: Sturdy footwear, warm clothing, packed lunch, water and raingear. Contribution: €5 includes refreshments after climb. Further information: 066 4010430 or 087 7942123. For updates please keep an eye on Facebook: Cnoc na d’Tobar. Cnoc na d-tobar, Cahersiveen, Co Kerry has been a sacred mountain since prehistoric times. On Saturday, March 26, a walk to celebrate Pilgrim Path Week will follow upwards the 14 Stations of the Cross on the mountain’s ancient trail. Summit views, as picture shows, are awe-inspiring. All comers are welcome, but please leave your dog at home, as the pilgrim path is on a working farm. 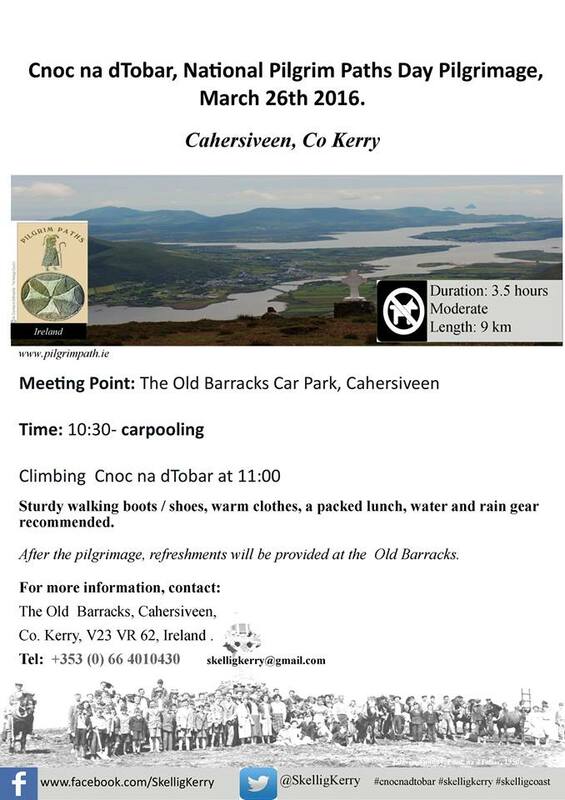 Meet: Old Barracks, Cahersiveen at 10.30 for carpooling. The Skelligs, (Unesco World Heritage Site), Cahersiveen Town, Valentia Island, West Cork, Corrán Tuathail (Ireland’s highest mountain), The Blasket Islands, Dingle Bay, Mount Brandon, Dingle Town, Mullaghanattin, (“the Matterhorn of Ireland”), Kenmare Bay, Drung Hill, Killorglin Town. On a fine day, it is possible to see Kerry Airport, with the help of binoculars! Information: skelligkerry@gmail.com, Facebook: Cnoc na d’Tobar.